A delicious and easy thai coconut soup made using few ingredients and without any processed foods. Healthy and full of flavor! Today I’m pleased to bring you a guest post with a recipe for tom kha gai – Thai Coconut Soup from Brad Shepherd of Fooduciary. His blog, like mine, encourages folks to ditch processed food for healthier alternatives. I love Thai food, but have never actually had tom kha ghai before because it usually has chicken in it. Luckily, Brad has created a meat-free (and vegan) recipe for everyone to enjoy! Be sure to check out the many great recipes and articles on Fooduciary and check them out on facebook too! What’s this farm kid from Utah doing cooking up Thai food? Couldn’t be any good, right? But hey, I made plenty of family meals with the aid of a gloved hamburger mascot and macaroni and cheese with my own creative flairs of adding hot dogs and peas. Leaving the processed food world three years ago opened my eyes to the fact that I didn’t really know how to cook. So how did I go from that king of boxed meals to Thai coconut soup? When you become choosier of what you eat, naturally many of the past frequented restaurants don’t make the cut. That is fine until it’s time for a night out with friends or family. What my wife and I learned was that we could suggest the restaurant and get everyone to ethnic restaurants where we had had good luck finding food that was truly made from scratch using real ingredients. And other than my stick-in-the-mud dad, everyone was pretty happy to try new dishes. 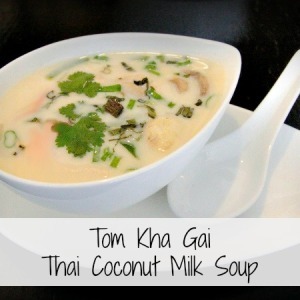 One of our favorite cuisines is Thai food and we quickly learned just how good tom kha gai is. We always get it whenever we go to Thai restaurants. But we wanted it more often than that, so we set off to create our own recipe that we could use to satisfy the craving any time it struck. The galangal root can be a bit of work to track down and you can make this without it, but it makes all the difference. It’s in the same family as ginger root but tastes totally different. You should be able to find it at any Asian market. Tracking it down is part of the fun! For a thicker soup and extra coconuttiness, we use a 7oz package of coconut cream in addition to the milk. Consider this optional. 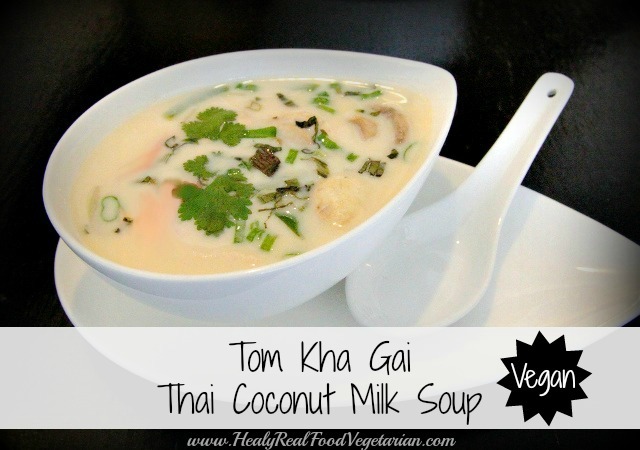 Have you tried this Thai Coconut Soup? Don’t forget to rate the recipe and leave me a comment below. You can also follow me on Facebook, Twitter, Instagram, Pinterest and YouTube. In a large sauce pan bring to a boil the vegetable stock, lime juice and leaves, lemongrass, and galangal. Simmer for 20 minutes. You can strain the liquid at this point if you prefer. The leaves and root are not intended to be eaten, though it’s common to just leave them in. Add coconut milk and cream then return to a boil. Lower the heat, add mushrooms and green onion. Simmer for 4-5 minutes then remove from heat. 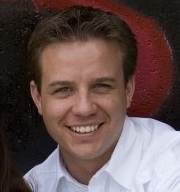 About the author: Brad Shepherd is the co-creator of Fooduciary.com. Through Fooduciary, Brad and his wife, Kelli, teach others how food impacts their health not just today but in the future. To help others make a gentle transition to healthy eating, Brad happily shares a FREE introductory guide called Five Days to Clean Eating. Don’t forget to check out fooduciary on facebook!